In preparation for Pascha, the Orthodox Church shifts its liturgical life on the Sunday of the Publican and the Pharisee. From this point we are guided by the Lenten Triodion, the service book that covers the pre-Lenten weeks of preparation, Great Lent, and Holy Week. The Gospel reading for the Sunday of the Publican and the Pharisee is Luke 18:10-14. As was the case for Zaccheus Sunday, one of the main characters is a publican—a despised class among the Jews. St. John (Maximovich) of Shanghai and San Francisco describes the history behind publicans and their role as tax collectors in his sermon for Zaccheus Sunday. The sermon below is by St. Ignatius (Brianchaninov) of Caucasus (1807-1867). St. Ignatius is the author of The Arena, a well-known ascetical work in the Orthodox Church. The sermon text, along with other information about the Sunday of the Publican and the Pharisee, is available at orthochristian.com. In today’s Gospel, the prayer of the publican is shown drawing God’s mercy to him. This prayer consisted of the following words: God be merciful to me a sinner (Lk. 18:13). It is worthy of our attention that God heard such a short prayer, and that it was pronounced in the temple, during the common worship services, during the reading and chanting of psalms and other prayers. This prayer is commended in the Gospels; it is set forth as an example of prayer, and it becomes our sacred duty to piously contemplate it. Why didn’t the publican choose some majestic and moving psalm by which to pour out his heart before God, but instead had recourse to such a brief prayer? Why did he repeat only it during the entire service? Our answer is according to that of the holy Fathers. When true repentance begins to shudder in the soul, when humility and contrition of spirit arises there because one’s eyes have been opened to the soul’s sinfulness, then loquacity becomes unbearable, impossible. Concentrating within itself, turning all its attention upon its disastrous condition, the soul begins to call out to God through some form of short, concise prayer. Because of the great benefit that brief, attentive, concentrated prayer brings, the Holy Church enjoins its children to timely learn some form of brief prayer. One who has learned such a prayer possesses a ready ability to pray in any place, at any time. While traveling, in the refectory, doing handiwork, or in the company of others, he can cry out to God. When it is not possible to pray with the lips, it is possible to pray with the mind. The convenience of brief prayer is obvious in this regard: it is quite easy to lose the meaning and order of lengthy prayers when we are occupied with something else, while short prayer always preserves its integrity. If it is left off for a time, one can return to it with little difficulty. Even during Church services, it is beneficial to repeat a short prayer in the cell of the soul—it not only does not sway the attention from the prayers being read or chanted in God’s temple, but it even facilitates particularly careful attention to them, preventing the mind from becoming distracted. If the mind is not restrained in introspection through a short prayer that fills the soul with a feeling of repentance, it becomes easily distracted. It drops its attention to the church reading and singing, and is drawn into empty musing and daydreams. This is what happened to the Pharisee mentioned today, who paid only superficial attention to the services, and was drawn into sinful thoughts. Sinful thoughts not only deprived his already weak prayer of any worth, but they also made it an excuse to judge a man who prayed. 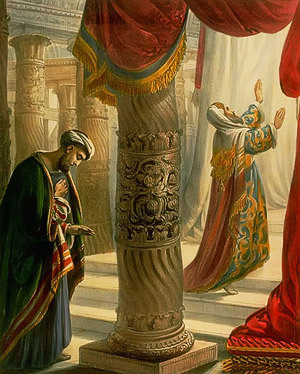 God rejected the prayer of the Pharisee—the Pharisee left the temple marked with the seal of God’s wrath, without understanding or perceiving his soul’s calamity, because his heart, dead to repentance, was filled with self-satisfaction and self-deception. When short prayer becomes a habit through frequent and constant use, it becomes something natural. When we listen to something that occupies our attention, we might utter various exclamations, which not only do not obstruct our attention, but even sharpen it. It is the same when we acquire the habit of brief prayer; through it we express our concordance with and attention to the prayers and psalms we hear. Throughout the forty days fast, at all the Church services, the prayer, God, have mercy on me, a sinner! is repeated aloud to all who are present. Why is the same prayer repeated so often? So that we would learn to repeat it often. The short prayer, Lord have mercy, is also repeated often, and for the same reason. When the Savior of the World commended the publican’s prayer, He later allowed and granted us to pray using His all-holy name. This prayer is called the Jesus Prayer, because of the Lord Jesus’ name, and because He instituted it. During the reign of the Old Testament, man turned in prayer to a God he still knew only imperfectly. When another reign began in the New Testament, an expansive completion to the old prayer was presented to man—a new way of praying to the God-Man as the intercessor between God and humans; a new way of praying to the intercessor through Whom the Godhead is united with mankind; to the intercessor Whom God hath declared (cf. Jn. 1:18), Who has described God to man with as much precision and fullness as is possible for human comprehension. The Old Testament prayer, God have mercy on me, a sinner, sounds like the New Testament prayer, Lord Jesus Christ, Son of God, have mercy on me a sinner. The Old Testament servants of God used the first prayer; the New Testament servants, while also using the first, use the second more, because it has pleased the God-Man to unite an especially miraculous spiritual power with His human name. Also used for ceaseless prayer is the prayer, Lord have mercy. It is an abbreviated form of the Jesus Prayer, and replaces it in those instances when it is hard to pronounce the entire Jesus Prayer; for example: when we are frightened, at times of unexpected joy, at times of serious illness, or during spiritual visions. In the latter instance, the exclamation, Lord have mercy is the mind’s response to the grace-filled knowledge that comes to it once it has been purified—a knowledge that exceeds the mind’s comprehension, and cannot be expressed in words. What meaning do the verb phrases, have mercy, or be merciful contain in all these prayers? It is man’s awareness that he is perishing; it is the perception of the mercy and pity that the Lord commanded us to feel toward ourselves, but which very few actually do feel; it is the rejection of our own self-opinion; it is a request for God’s mercy, without which there is no hope of salvation for the one who is perishing. God’s mercy is nothing other than the grace of the All-Holy Spirit, and we sinful ones should ceaselessly and unrelentingly ask it of God. Have mercy, my Lord, upon the disastrous state into which I have fallen, having been deprived of Thy grace, and again make Thy grace to dwell in me. Strengthen me with Thy governing spirit (Ps. 50:12), a spirit of Thy power, so that I might withstand the temptation brought against me by the devil, and the temptation that comes from my fallen nature. Send me a spirit of chastity, so that I might come out of this state of delirium, and correct my moral steps. Give me the Spirit of Thy fear, so that I might have (godly) fear of Thee, as it is proper for a weak creature to fear his great God and Creator, so that by my awe before Thee I might hold Thy commandments sacred. Root love for Thee within my heart, so that I may never again be separated from Thee, nor be distracted by an irresistible attraction to loathsome sin. Grant me Thy peace, that it might preserve my soul in unperturbed calm, not allowing my thoughts to wander over the entire universe without need and to my own injury, to my own confusion; that it might concentrate them in introspection, and bear them upwards thence to Thy throne. Give me a Spirit of meekness, so that I might refrain from anger and malice, that I might be continually filled with goodness toward my brother. Give me a Spirit of humility of mind, so that I would not be high-minded, or dream about myself, or seek praise and human glory; but that I might rather remember that I am earth and ashes, a fallen being, cast down to the earth for my unworthiness. I must be taken from this body and world by death, and appear before Thy dread and impartial judgment. God, be merciful to me a sinner! Lord Jesus Christ, Son of God, have mercy on me! Lord, have mercy! Many pronounce these brief prayers with great haste, caring only to say the required number of them. By this manner of praying, they do not allow the prayers to penetrate the heart and produce their inherent effect, which is tender feeling. The holy Fathers justly note that whoever prays thus prays to the wind, and not to God. Why do we get bored in church? Because we have not felt the effect of prayer. Why do we rush to a lavish table? Because we know the meaning of material food from experience. Why do we not rush to church, but try to come a little later, when a significant portion of the Divine services are already over? Because we do not know from experience the meaning of prayer, which is food for the soul, and which imparts spiritual strength to the soul. We do not know from experience the meaning of prayer because we pray hastily, superficially, and without attention. The effect on the soul of long but inattentive prayer is like the effect of copious rain upon a metal roof, from which all the water runs off, no matter how much it pours, without having any effect at all upon the roof. In contrast, attentive prayer can be likened to a beneficial rain that waters a planted field, giving nourishment to the growth there, and preparing a rich harvest. Let us provide our prayer with two qualities: attention and repentance. Let it fly up to the heavens with them as upon two wings, then appear before the face of God, and intercede for us to gain His mercy. The blessed publican’s prayer had these two qualities. Penetrated by the awareness of his sinfulness, he did not have any hope in his own deeds to receive salvation; he had hope only in God’s mercy, which calls all sinners to repentance, and grants them salvation for repentance alone. 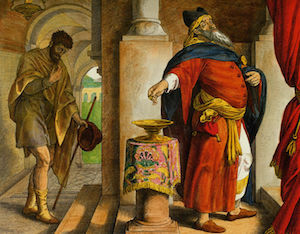 As a sinner who had no goodness of his own, the publican took the last place in the temple. As a sinner who is unworthy of heaven, he did not dare to lift his eyes unto heaven. His eyes were directed toward the ground; and beating upon his heart with repentance from deep within his heart, he pronounced with his whole soul the prayer united with his confession: God be merciful to me, a sinner. His prayer was so effective and strong, that the sinner left the temple of God justified. The Lord Who knoweth the hearts, the Savior of men, testified to this—and the Prophet’s words were fulfilled in this repentant sinner: For the Lord shall build up Sion to the human soul that has been destroyed by the fall, and He shall be seen in His glory. He hath regarded the prayer of the humble, and hath not despised their supplication. Let this be written for another generation; let it be written that all mankind would know it, let it be written that all tribes and future Christian generations might know it! And the people that is being created through repentance and attentive prayer, having felt their renewal through Divine grace, shall praise the Lord (Ps. 101: 16-18), Who hath been well pleased to take on humanity, and to save people through His wondrous care, and His wondrous teachings. Amen.